For football fans in Africa, the UK's English Premier League (EPL) is king, the ultimate championship, their main place of their worship. The global football brand is followed by more than a billion people around the world and 260 million of these are in Africa. As the 2015-16 season kicks off, bars and cafes from Cape Town to Cairo will be preparing for an influx of fans, getting ready to follow the action on big screens. But which team is the most popular on the continent? There is no doubt Chelsea is the club of choice in this region. You cannot talk about the Premier League in West Africa without thinking of Didier Drogba, Solomon Kalou, Samuel Eto'o, Victor Moses, Michael Essien and John Mikel Obi, all West Africans who have played for The Blues. However, Drogba stands out because of his achievements both on and off the field. Of course, he was a legendary striker for the club, scoring the winning penalty to clinch the Champions League for Chelsea in 2012, and also becoming the first African player to score 100 EPL goals in the same year. But he is also widely revered in his native Ivory Coast for his peace-building efforts after a conflict broke out in 2010-2011, and has started his own foundation to promote health and education in the country. The colour of choice for East Africa is red for Arsenal. Much of the Gunners' popularity here can be put down to the "Invincibles", the record-breaking team of the 2003-04 season which won the league without losing a single match, as part of a 49-game unbeaten run. A strong showing of African players like Nwankwo Kanu, Emmanuel Adebayor, Kolo Toure and Lauren made them even more popular. Kanu is surely one of the main reasons for Arsenal's popularity in Nigeria as well. 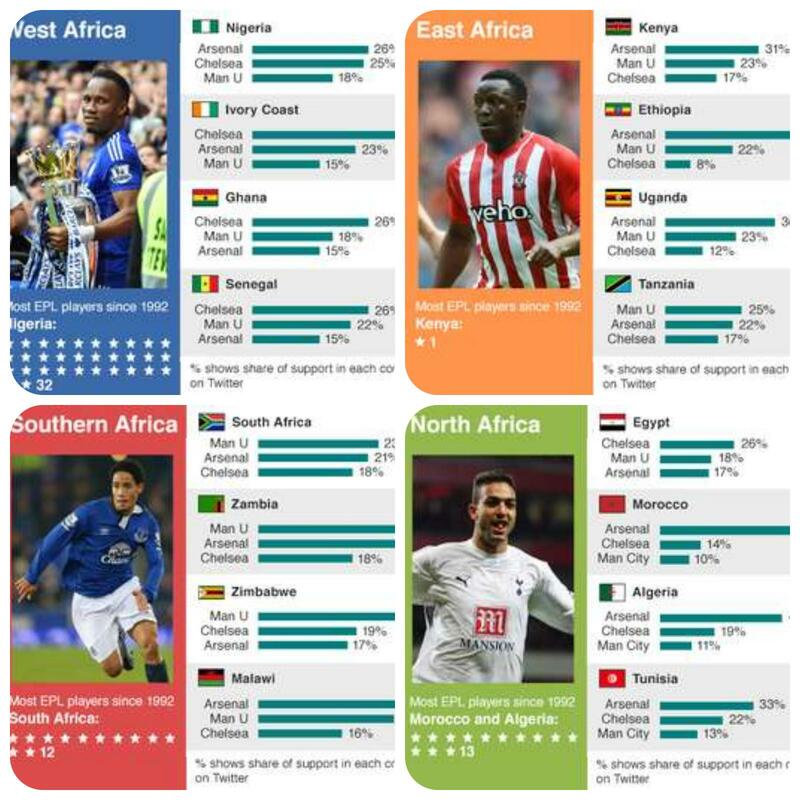 Surprisingly only one East African has ever played in the Premier League - Kenya and Southampton's Victor Wanyama. It is not a surprise that Manchester United is the most popular club in southern Africa. They are the most successful team in the history of the EPL, winning 13 titles since the league started in 1992. They also signed one of South Africa's biggest stars, Quinton Fortune, who played for the Red Devils for seven years. He is also one of the many ex-players who travel to the region as a brand ambassador every year. South Africa was the first country in Africa to have an official Manchester United Supporters Club. For North Africans Arsenal is the club of choice. The Gunners have solid representation in Morocco, Algeria and Tunisia. Active fan clubs in these countries have helped popularise the north London club through activities such as the annual fun run "Be a Gunner. Be a Runner". But in Egypt, it is Chelsea which rules the roost - thanks to Mohamed Salah's $17m (£11m) move to the English champions in January 2014.